School districts, which generate the largest share of New York State’s high local property taxes, have now entered their fourth annual budgeting cycle under a property tax cap enacted in 2011. It seems clear the tax cap is making a difference. 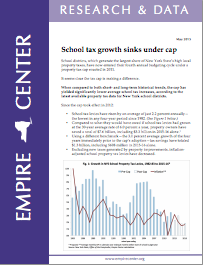 When compared to both short- and long-term historical trends, the cap has yielded significantly lower average school tax increases, according to the latest available property tax data for New York school districts. Using a different benchmark—the 3.0 percent average growth of the four years immediately prior to the cap’s adoption—tax savings have totaled $1.3 billion, including $608 million in 2015-16 alone. Excluding new taxes generated by property improvements, inflation- adjusted school property tax levies have decreased. Effective in 2012, the increase in total local property taxes imposed or “levied” by fiscally independent school districts in New York State has been capped at 2 percent, or the rate of inflation, whichever is less.2 School district taxes and budgets remain subject to voter approval, as they were before the cap. The cap supersedes the previous state law, which allowed districts, in the case of a budget’s rejection by voters, to impose whatever taxes were necessary to implement a “contingency” plan increasing spending by up to 4 percent, or 1.2 times the preceding year’s inflation rate. The tax cap law allows school districts to exceed the tax levy cap if such an “override” is approved by at least 60 percent of the budget voters. However, even a tax levy increase under the cap requires approval by at least a simple majority of voters. If a budget (whether over or under the cap) is rejected on its first submission, the school board is allowed just one re-vote, either on the same proposal or some modified version. If the budget fails a second time to win at least a simple majority (if under the cap) or a supermajority (to override the cap), the district’s tax levy is frozen—effectively an absolute cap of zero. Major exceptions to the cap are (a) “quantity change” in taxable property values due to new construction or other property improvements; (b) voter-approved capital costs, including debt service; and (c) an increase in pension contribution rates that exceeds two percentage points in any given year.3 In addition, school districts can carry over up to 1.5 percent of unused allowable levy growth to the following year. The tax cap was adopted following a 30-year period in which school tax levies rose from $3.5 billion to $19.7 billion—an average of 6.0 percent a year during a period when inflation averaged 3.3 percent a year. 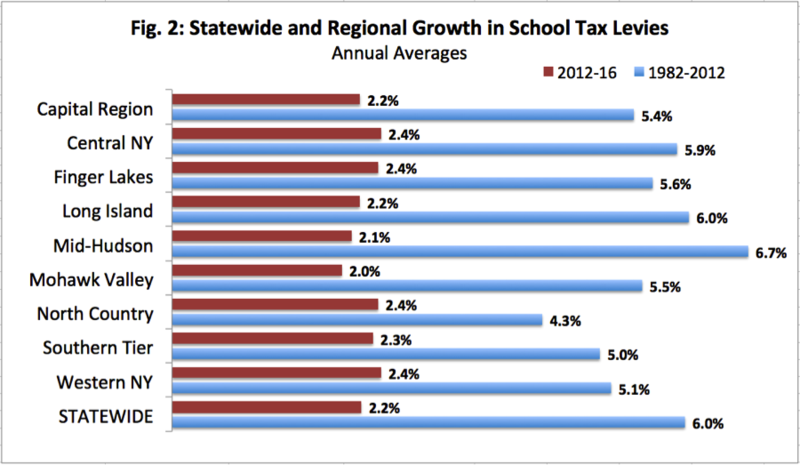 Figure 2, below, provides both a statewide and regional breakdown of average increases in school tax levies during the 30 years prior to and the four years since the effective date of the tax cap. As shown, the underlying Consumer Price Index averages used to calculate the starting point for each district’s tax cap totaled 8.5 percent during these four years, including the rate used for 2015-16 proposed budgets. For properties already included in the assessed tax base in the year the cap was adopted, the total school tax levy increase under the cap has come to 7.4 percent, which means the average property owner has seen school taxes increase by less than inflation. 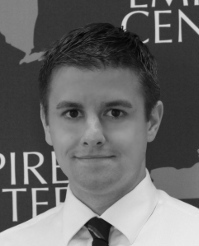 Excluding new construction, the lowest levy increase on existing properties was 6.1 percent, in the Mohawk Valley, while the highest—still comfortably below inflation—was 7.8 percent, in Long Island. The combination of the basic tax cap, the supermajority requirement for overrides, and the limit on budget re-votes—backed by the prospect of a hard tax freeze in districts that fail to pass a budget—undoubtedly has suppressed tax increases to some degree. It’s impossible to calculate exactly how much levies might have risen if the cap had never been adopted—or, by the same token, to forecast future savings assuming the tax cap is permanently extended. But for illustrative purposes, it is possible to calculate a range of possibilities based on the actual long- and short-term trends in levy increases before the cap was adopted. See Figures 4 and 5 below. Slight differences can make a large difference over time. As shown above, taxes in 2015-16 would be $608 million higher if the average growth rate since 2012 had continued at 3 percent, less than a single percentage point higher than the actual result. Looking ahead, growth averaging 3 percent will boost taxes another $1 billion by 2021 and $2 billion by 2026, compared to continued growth of 2.2 percent. The long-term average rate of 6 percent would yield tax hikes twice as large. Every added percentage point of future growth statewide would mean another $200 million in school taxes above current levels. 1 During the same period, New York’s state taxes from all sources grew by an average of 5 percent a year. 2 Throughout this paper, inflation is calculated in the manner required by the tax cap law: the average of the 12 monthly consumer price index (CPI) values during the calendar year prior to the start of the school year 2 Throughout this paper, inflation is calculated in the manner required by the tax cap law: the average of the 12 monthly consumer price index (CPI) values during the calendar year prior to the start of the school year for which the levy cap is being calculated. Thus, for example, in 2015-16, the inflation factor of 1.46 percent is the average growth in the CPI during 2014. 3 This exclusion was triggered only in 2013-14, adding an average of 1.9 percent to allowable levy limits. 4 Taxes attributable to property improvements yielding increased assessments are paid only by owners of those improved properties and do not result in higher taxes on owners of properties with unchanged assessments in the base year. 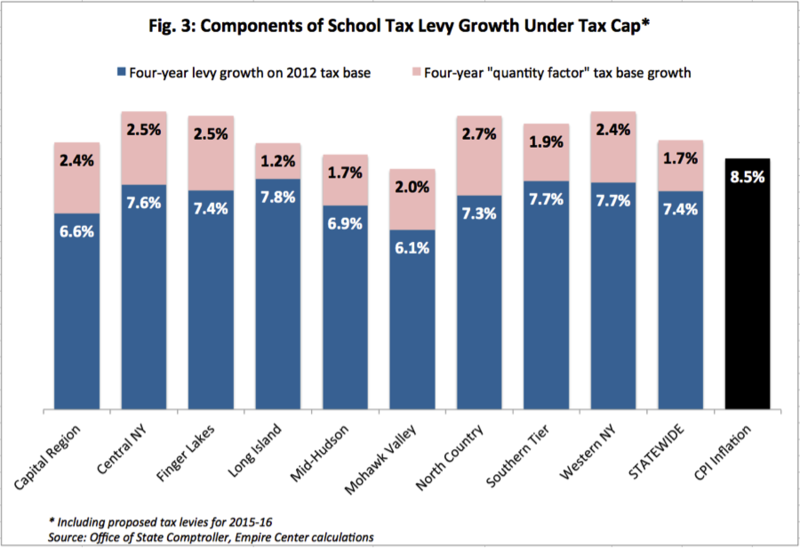 Under tax cap, NY school tax levies up just 2.2% annually, slowest for any 4-year period in at least 34 years. 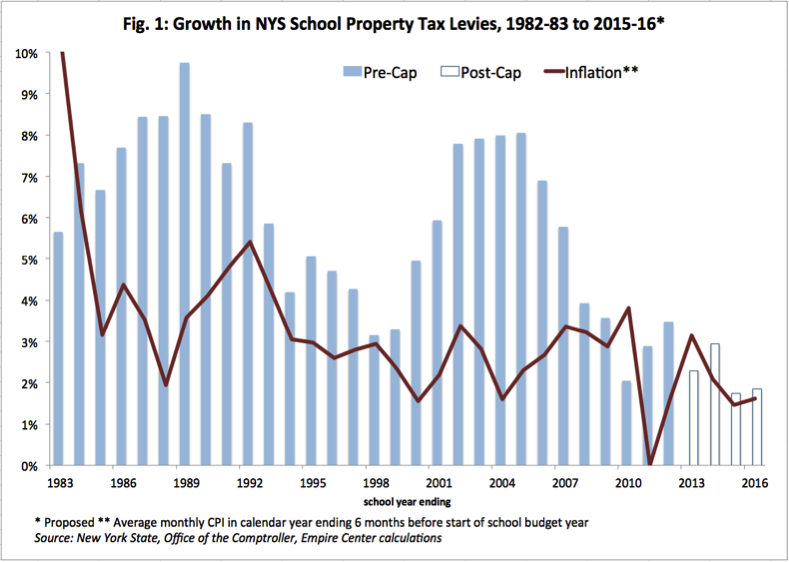 School property taxes across NY used to be growing out of control. Not any more, thanks to tax cap initiated in 2012 by @NYGovCuomo. NY school taxes statewide have grown less than inflation since 2012, after excluding base growth due to property improvement. 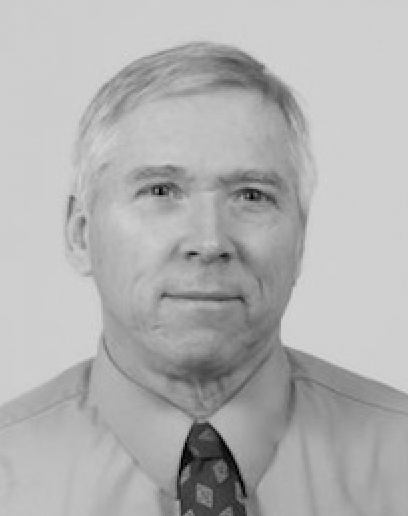 To keep a lid on school property taxes, NY's tax cap needs to be made permanent. #KeeptheCap.